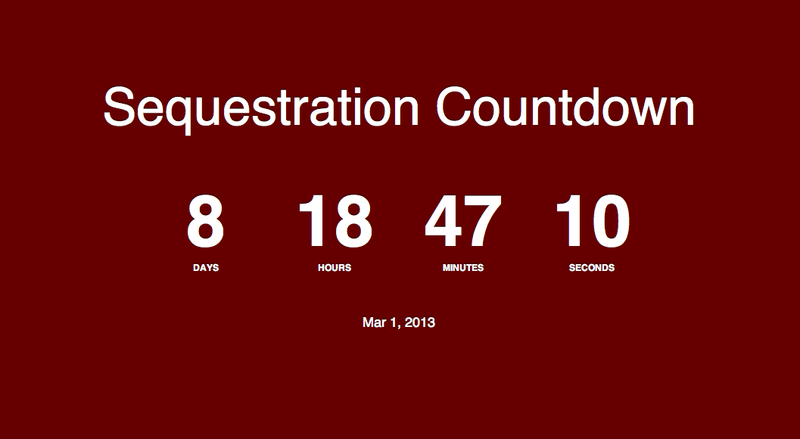 Sequestration Countdown – Obama Turns Up The Pressure….Republicans Still The Party Of No! WASHINGTON — Days away from another fiscal crisis and with Congress on vacation, President Obama began marshaling the powers of the presidency on Tuesday to try to shame Republicans into a compromise that could avoid further self-inflicted job losses and damage to the fragile recovery. But so far, Republicans were declining to engage. To turn up the pressure on the absent lawmakers, Mr. Obama warned in calamitous terms of the costs to military readiness, domestic investments and vital services if a “meat-cleaver” approach of indiscriminate, across-the-board spending cuts takes effect on March 1. Surrounding him in a White House auditorium were solemn, uniformed emergency responders, invited to illustrate the sort of critical services at risk. The president plans to keep up the pressure through next week for an alternative deficit-reduction deal that includes both spending cuts and new revenues through closing tax loopholes. He will have daily events underscoring the potential ramifications of the automatic cuts, aides said, and next week will travel outside Washington to take his case to the public, as he did late last year in another fiscal fight on which he prevailed. He framed the debate in the way that he hopes will force Republicans into accepting some higher tax revenues, something they so far refuse to do. Mr. Obama once again finds himself in a budget showdown with the opposing party, and numerous polls show his position to be more popular than Republican calls for spending cuts only, including cuts in Medicare. Mr. Obama and senior aides hardly disguised their sense of political advantage. “We are trouncing them,” said one senior administration official about the Republicans. Still, the president’s leverage might in fact be limited, since by all appearances he seems to want a deal far more than Republicans do. As the leader of the nation, Mr. Obama is eager to see an end to the repeated evidence of Washington dysfunction, or what he referred to again on Tuesday as the cycle of “manufactured crisis.” And with his legacy ultimately at stake, he needs to lift the fiscal uncertainty that since 2011 has held down economic growth. Despite the risks of an impasse for Republicans, those who control the House have all but forfeited this battle to Mr. Obama and seem poised to let the automatic cuts take effect. 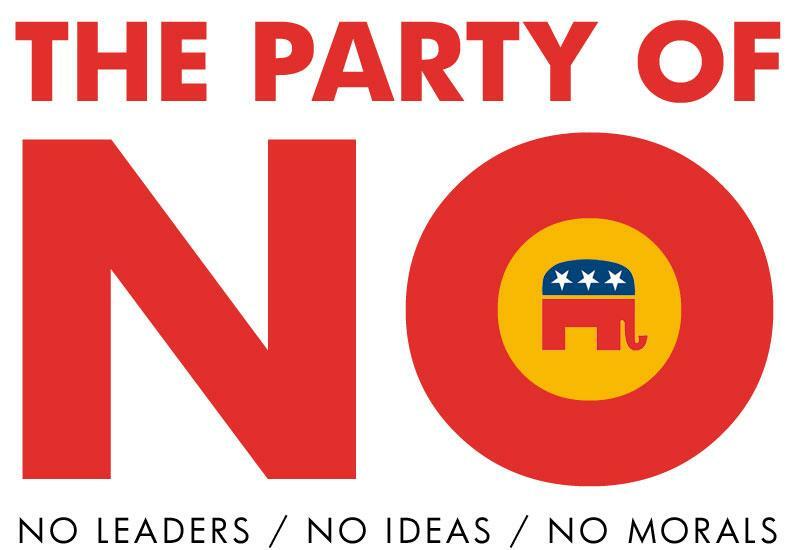 Many Republicans, particularly newer members elected with Tea Party support, have pushed party leaders to accept the sequester and lock in the spending cuts rather than compromise. The leaders seem to have decided to wage battle later this spring in the larger fight over the annual federal budget. Contributing to Republican calculations is the fact that at least in the short term, an impasse over the sequester is not as potentially catastrophic as the threats that loomed in past partisan showdowns, like a full shutdown of government or the nation’s first-ever default on its global debt obligations. The potential impact is potentially hazardous nonetheless, both economically and politically. As Mr. Obama noted, the prospect of the sequester has already affected military deployments and hiring by military contractors, and threatens layoffs of teachers, air traffic controllers and researchers, among others. Hours after the president’s remarks, economic forecasters at Macroeconomic Advisers, based in St. Louis, projected that sequestration would reduce the firm’s forecast of growth this year by nearly a quarter, 0.6 percent, and cost roughly 700,000 civilian and military jobs through 2014, with heightened unemployment lingering for several years. “By far the preferable policy,” the analysis said, “is a credible long-term plan to shrink the deficit more slowly through some combination of revenue increases within broad tax reform” as well as “more carefully considered cuts” in spending programs, including Medicare and Medicaid. That prescription for both long-term spending reductions and revenue increases, as an alternative to immediate deep spending cuts that inhibit job growth, generally tracks Mr. Obama’s approach. He has proposed $1.5 trillion in spending cuts over 10 years and revenue increases that would build on the roughly $2.5 trillion over the decade that he and Congress have agreed to in the past two years. The total, $4 trillion, is the minimum reduction that many economists say is necessary to stabilize the growth of the nation’s debt at a time when the population is aging and health care costs are rising. That approach mixing spending cuts and increased revenues got another endorsement on Tuesday when the chairmen of Mr. Obama’s 2010 debt-reduction commission — former Senator Alan K. Simpson, a Republican, and Erskine B. Bowles, a Democrat and former chief of staff to President Bill Clinton — released a revised fiscal plan that would reduce annual deficits by $2.4 trillion in a decade through spending cuts, including in Medicare and Social Security benefits, and an overhaul of the tax system. But Republicans say they will not consider additional tax increases since Mr. Obama in January won more than $600 billion over 10 years in higher revenues from the wealthiest taxpayers. 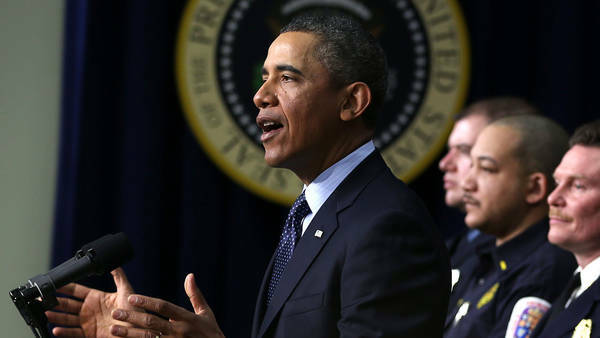 “The revenue debate is now closed,” Speaker John A. Boehner said in a statement reacting to the president’s remarks.